The 2018 Shanghai Art Week kicked off purringly, with an eight-metre high, 15-metre long psychedelic cat created by artist Cheng Ran and installed by the Art021 fair in the plaza of the Jing’an Kerry Centre. Cheng and his Martin Goya Business, an artist-run space in Hangzhou, organised a selection of works by young artists within the belly of the inflatable beast. 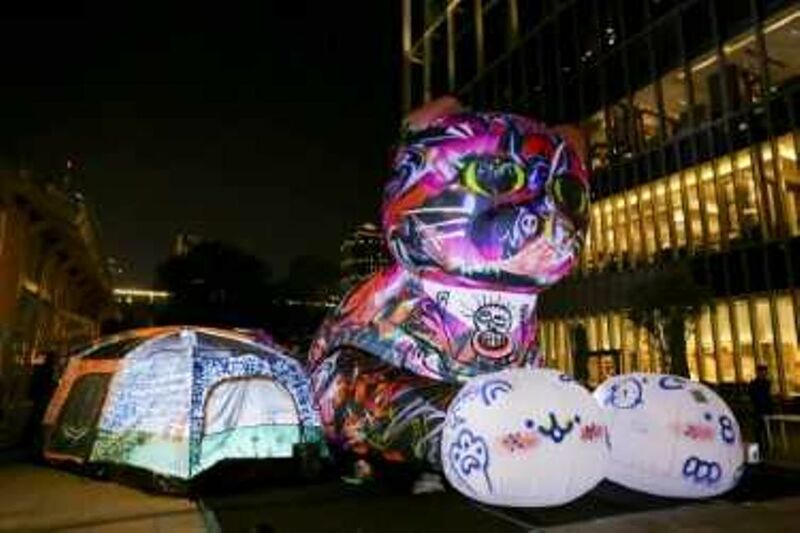 The group of artists, including Chai Chai, Nai Fen, and Zhou Yilun, also grafittied up the cat’s exterior and its entrance tents. Dubbed The Windy Theatre, the massive mog is modelled after One-ear, one of Cheng’s 17 cats. The one-eared tuxedo was rescued in 2015 from an illegal meat truck carrying almost 200 cats, of which about a hundred survived (incidentally, Cheng adopted the cat after noting he was the mirror image of Cheng’s two-eared first cat Martin Goya). Part of Art021’s new Beyond-Extends city-wide public art initiative, The Windy Theatre was first installed at the Jing’an Kerry Centre from 28 to 30 October, and will next loaf at the entrance of the Shanghai International Exhibition Centre for the duration of the art fair (8 to 11 November). A spokeswoman says there are tentative plans for it to return to the nearby Kerry Centre after the fair, or to travel to other sites, hosting events promoting animal adoption with local rescue group Think Adoption. Cheng’s special edition cat backpack modelled after cat Martin Goya (complete with detachable furry balls) is for sale during the event. “It may look cute or silly, but it is about loving and protecting animals, and to prompt people to think about compassion and their own behaviour," Cheng Ran says.